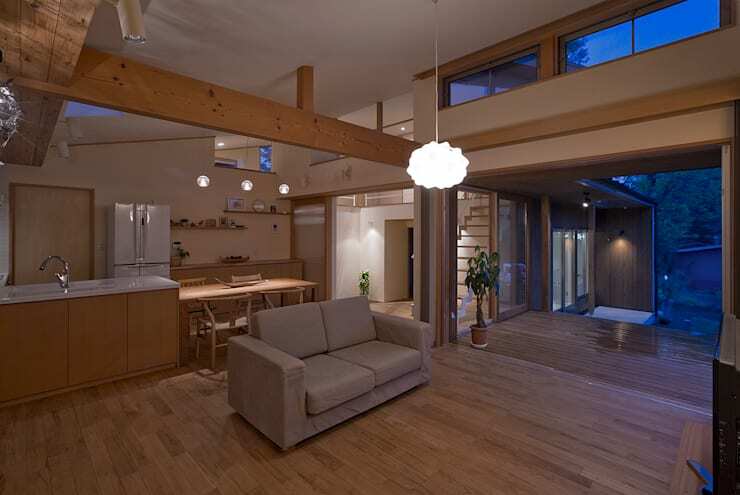 Today on homify we travel to the northern Kantō region of Japan. Here we will explore a wooden Japanese home with a huge, open interior of double height and some uniquely Japanese features. The dramatic pull of the large open space gives the home a naturally internal focus. But the home also has an L-shaped layout. As with many L-shaped homes, the two wings of the home have abundant glass doors that create a sort of embrace around the outdoor area. This makes the outdoor deck an integral part of the internal decor. As a result, the home is not only private—it's also saturated in natural appeal. Come with us to explore its features further through a series of beautiful photos. 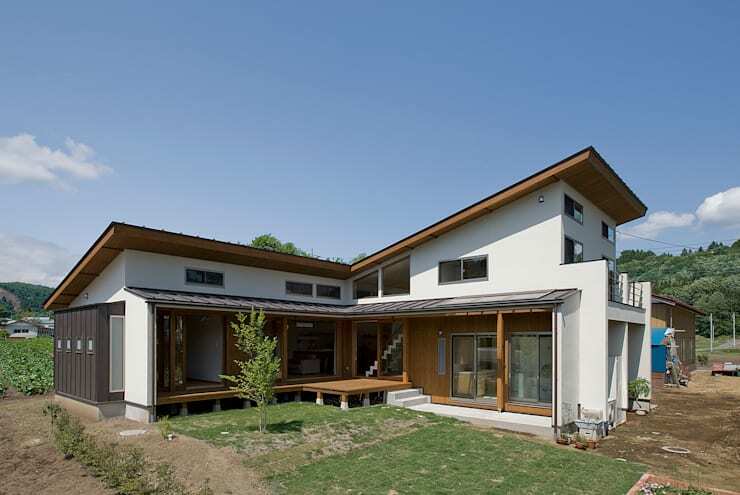 We should add that it comes to us courtesy of Japanese architects Atelier N. Enjoy! The two-level home has a welcoming natural appeal. This is largely due to the use of natural materials and the obvious benefits of an L-shaped configuration. The facade is white, but trimmed with vast amounts of wood, glavanised steel cladding and white plaster walls. Note the unusual formation of the second level. It starts at half height and reaches its full expression in the sloped roof on the right. The material of this roof also has linked to traditional Japanese architecture. 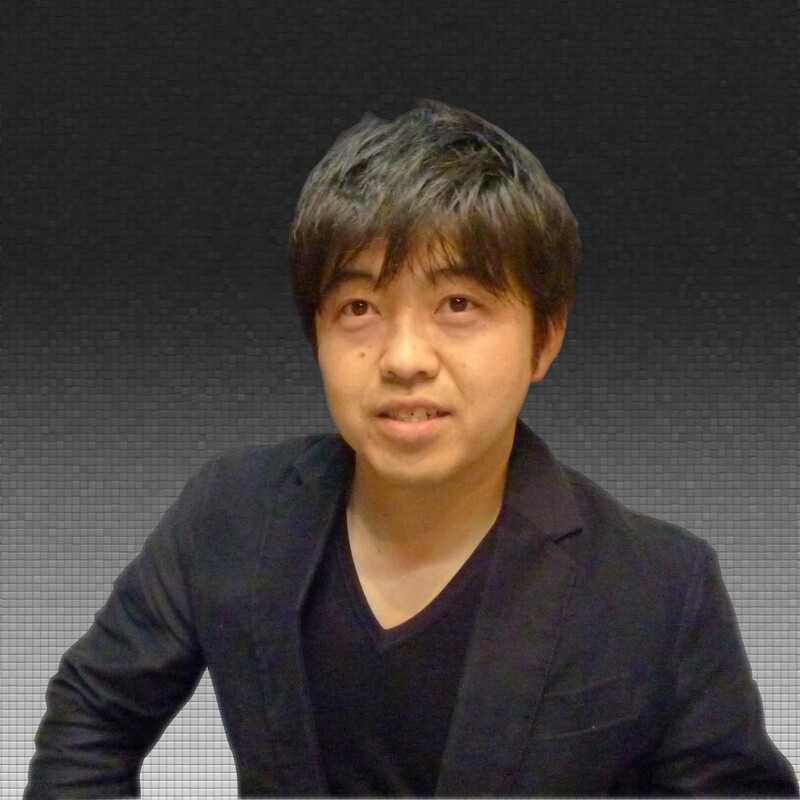 It is made from colored galvanized steel in the Itabuki style. This was partly chosen because a wooden version of this style of roof shingle was commonly used in mountainous areas of Japan. On entering the home, we come to a corridor with small set of steps and a large modern white staircase. From here we also have a good sense of the internal windows that lead to the second level. The complex series of relationships here really highlights the difference in height of the various spaces. 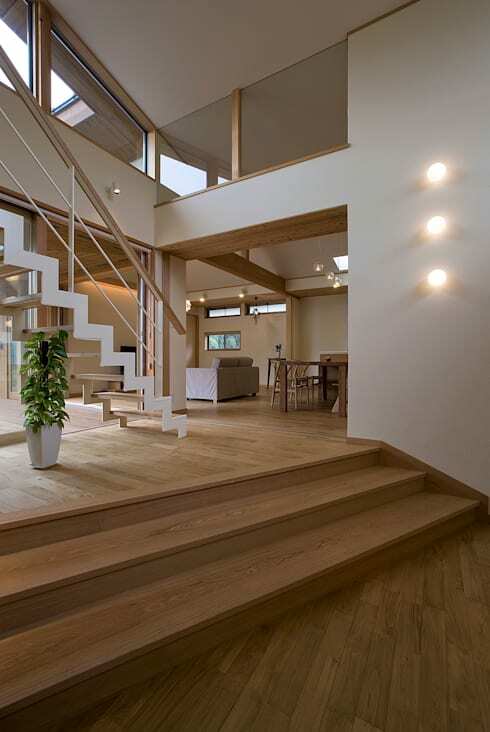 The entrance is almost always an important architectural feature in Japanese homes. The soft walls and ceilings are composed of diatomaceous earth. These are also known as Satori walls. This kind of wall has been used in Japanese tea houses, temples and interiors for centuries. It is composed of mineral rock that has been broken down into sand and combined with a pigment. It is a natural fire retardant allows the home to breathe. In this living room, they give the home a lot of subtle, natural variation. 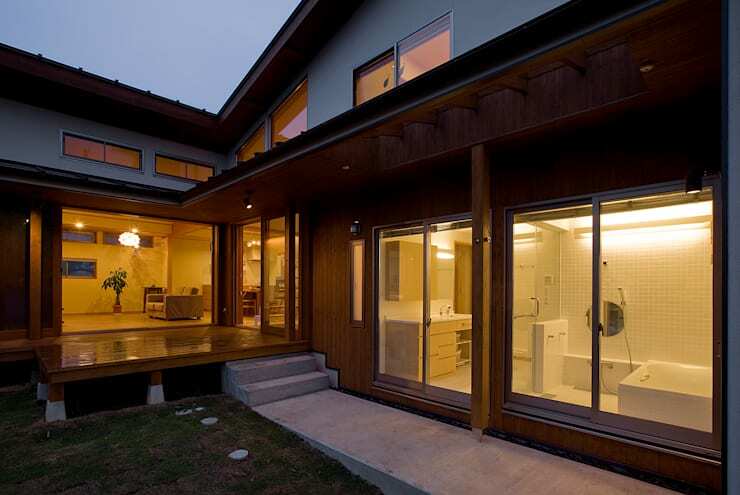 Finally, note how the outdoor deck can be accessed from the various areas of the home. In this evening view of the outdoor deck, we can see how the dark wooden materials give the home a very warm, cosy appeal. 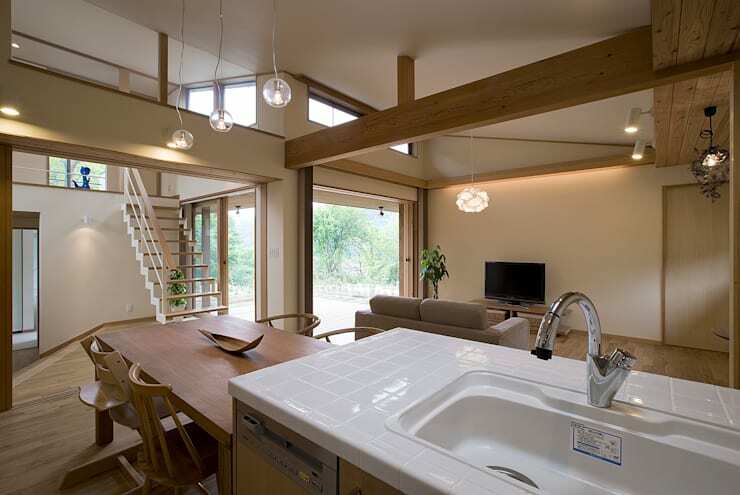 As with many Japanese homes, there is minimal decoration or furniture. But this doesn't detract from the form in the least. Instead, it serves to highlight the simple beauty of the space. If you are interested in Japanese architecture, you'll love The vertical house of Japanese minimalism. This home has so many unusual features its hard to choose a favourite! Let us know what you like about it in the comments.